While no actual prototype of AirWorld has been found, programmer Tod Frye recently acknowledged that the game was at least started. "AirWorld was based on the I Ching. As far as I got, it was never fully playable. But I was psyched to be doing it. One flew around in a (sort of) first person flying scenario with 64 hexagrams on the horizon, dodging some stuff in the air, and picking some other stuff. When you picked up a certain token, you entered the 'in hexagram' phase, where you locked on a hexagram of your choice on the horizon, and it zoomed up to fill the screen, where you played one of 64 simple games (the 64 simple games never got finished, to ambitious)." It appears that Tod was pulled off of AirWorld to work on Xevious after the original programmer wasn't making enough progress. This isn't surprising since AirWorld wasn't considered as high of a priority as Xevious and Tod had a reputation of being a brilliant programmer. With no programmer left to finish AirWorld the game was cancelled and the contest scrapped. Ironically Xevious was never released either. After talking to a few people I have been able to piece some information together about I Ching. The I Ching (Book of Changes) is an ancient Chinese text, and is one of the five classic books of Confucianism. The I Ching itself is a series of 64 hexagrams (six line figures), made up of all the possible combinations between the eight trigrams (Heaven, Wind, Water, Mountain, Earth, Thunder, Fire, and Lake). The trigrams are combinations of solid (---) and broken (- -) lines, the former representing the force of yang, the latter the force of yin. The eight trigrams show all possible combinations of these two lines, with three lines in each trigram. Just as the solid and broken lines are opposed, representing the primordial tension between yin and yang, in the same way the trigrams (in one formulation) are arranged as a set of opposites Each trigram in the circle thus stands in opposition with it's mirror image, with the opposing pairs being heaven/earth, fire/water, mountain/lake, and thunder/wind. This may seem like pretty deep stuff for a videogame, but if you look back on the previous three installments, you'll realize that they had similar spiritual themes. Earthworld was based on the Zodiac, Fireworld was based on the Tree of Life, and Waterworld the Chakra. These secondary themes were only used to determine the room structures, and were never mentioned in the games themselves with the exception of Earthworld. In fact most people never knew the games had a theme beyond the basic elements (Earth, Fire, Water, Air), the secondary themes almost seem to be Tod's little inside joke. "No, there was no "AirWorld" story ever written or drawn. 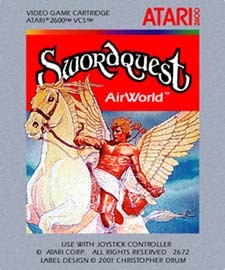 The whole SwordQuest project was terminated by Atari before we could even start on the art. Roy Thomas and Gerry Conway may have worked out some sort of plot synopsis dealing in the generalities of that final chapter for Atari approval, but it never got to plot form." However prototype artwork for AirWorld does exist. 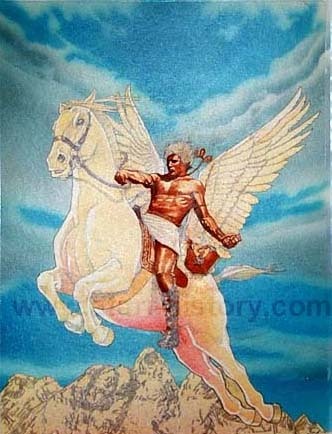 The picture depicts Torr on a winged horse holding the Philosophers Stone under his arm. This artwork probably would have been used for the AirWorld label. (Artwork courtesy of the Atari Historical Society). So will the collecting community ever get to the most sought after 2600 prototype? That remains to be seen, but at least we now conformation that Airworld was at least started. That means there could be one out there somewhere, just waiting to be discovered. 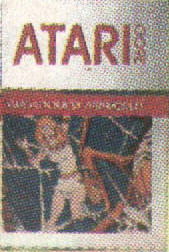 Very early artwork for the AirWorld box was shown in some advertisements. It's doubtful this artwork would have been used as it is very different than any of the other SwordQuest games.